The plywood tops of our peninsula cabinets didn’t extend to the wall or the end of the bar, leaving a gap of almost 2″ on either end. Our tile setter needed the gaps closed up (or nearly so), in order to lay down a bed of mortar for the tile. We had a piece of 2×6 laying around, so we ripped it in half and screwed a piece of 2×3 into place through the top of the cabinet. 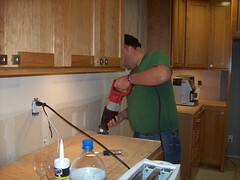 We had to pull the scribe pieces off the upper cabinets flanking our range and hood. These were installed to cover the joint where the cabinets meet the drywall, but we’re going to install backsplash tile over the drywall. 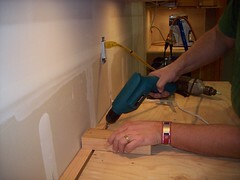 We’ll re-install the scribe to cover the cabinet/tile joint once the backsplash is in place. We trimmed 5/8″ from the tops of the lower cabinets on either side of the range to allow for the countertop tile to wrap over the ends. This was a bit nerve wracking, since I didn’t want to nick the cherry face frame with my circular saw. Careful depth adjustment and a steady hand did the trick, though. I couldn’t find my hand saw to finish the cut at the wall, so once again the [Sawzall] came to the rescue. Probably the most annoying thing about all this prep work is that we had to shut down our laundry and kitchen again. Our washer and dryer are parked in the untiled part of the hallway, and our kitchen facilities are now limited to the faucet (but no sink), toaster, coffee pot (gotta have it! ), microwave, and refrigerator (standing in the middle of the kitchen)–No sink, disposal, dishwasher, or range. The old faucet will be removed on Thursday, and on Friday night I have to disconnect the three electrical outlets I had hooked up in the kitchen. 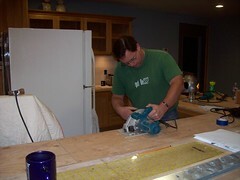 But the good news is: we should be able to commence the finishing work on our kitchen Sunday afternoon/evening! This entry was posted in Our home remodeling project, Uncategorized and tagged tile. Bookmark the permalink.